Is this the Motorola Moto X+1 starring in a video? An earlier video showing off the Motorola Moto X+1, was taken down because it supposedly revealed some identifying marks. Now, with the handset covered in Saran Wrap to cover up those marks, the eagerly awaited handset returns to video. A lot of the phone's features have been disabled, like the ability of the phone to respond to "Hello Google," and we are told that the camera is working intermittently. While another video is promised that will compare the Moto X+1 to the Motorola Moto X, we are told that the device is indeed larger than the original model, and sports a 1080 x 1920 resolution screen. The source of the video had promised $25,000 to anyone who delivered the device to them, and apparently a Motorola employee, or someone with access to the phone, took advantage of the offer. We don't know if the promised funds were exchanged for the handset, but we sure would like to see the unit sans the Saran Wrap. 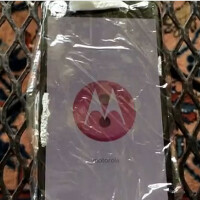 The Motorola Moto X+1 is expected to come to market with a 5 inch screen, driven by a quad-core Snapdragon 800 processor. 2GB of RAM is on board with 64GB of native storage and a microSD slot has been added for those who need additional memory. Sounds like Motorola had their listening ears on when designing this sequel. I have one, thank you very much. I just want to read/follow the M8 journey, which they seemed to continue for the S5 but somehow forgot about the M8. It's not self-entitled whining. It's just whining, which ironically, is what you're doing about my comments lol. Smooth..
http://www.phonearena.com/contacts Contact PA. Don't threaten them through comments. Nobody is going to like you posting this on every article just so you can get your way. Cheers Dr.Phil, I'll contact them there. Keep em coming Moto. Having low cost phones on the market is going to stick it to the big carriers who need 2 yr. agreements to be profitable. Once that is gone. The cost for sevice will drop considerably and everyone will be able to get a good phone at a good monthly price with out being "raped" by the carriers as John L would say. lol. The X was anything but low cost. If you ask me I think it was too high with specs that aren't on the level of the equally priced Nexus 5. Sources or it didn't happen. Well if it's anything like my Droid Maxx, you have to say 'Ok, Google NOW.' not just 'Ok, Google' and also you have to train it specifically to your voice. Maybe this is his first time with a smart phone? Same thing on my Moto X. It has to be Okay Google Now for the Motorola's app to catch it. Even in Google Now, "Okay Google" won't activate. "Okay, Google" works fine for me. the moto x+1 was a good 1cm taller, thats more than just a .3" screen size leap, I would guess it will have a 5.2" screen like earlier leaks suggest. BUT, I think we will also see a 4.7" version, since motomaker gives them that ability. it's just my preference that's all. yes, if/when the phone freezes, its the only out. i encounter that (tried all kinds of ways, couldnt get it to restart) and my phone's removable battery got me to restart. I think we'll have to wait and see on that. They did a great job with the original in keeping the bezels trim, and if they do the same here I think we could have another device that will still be plenty usable with a single hand. i don't think Touchless Controls were disabled, i think he just wasn't doing it right, it's "Okay Google Now" not "Okay Google"... i hope the Moto X+1 isn't too much bigger. i like the size of the current X a lot... save the large screens for the Droids. Touchless Control on the Motorola Phones is different. Touchless Control works while the phone is locked and is triggered by the launch phrase "Okay Google Now" what you're talking about is native to the Google Search app. "Okay Google" works for my Droid Mini. Come on moto give us the snapdragon 805, the 800 isold news and already outdated.